It must be hard for the folks at DC. 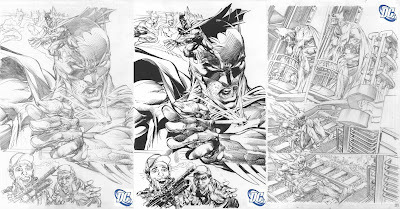 They pull together two of the biggest talents ever to work on the Dark Knight for one more reunion tour, and in waiting for the content to be done before they solicit it, preview pages flood the internet and let the bat out of the bag. But what can you expect when those two legends are non-other than Frank Miller and Neal Adams? No one has come close to nailing the bat in the way Neal Adams did in his run with Denny O'Neil, and from the looks of it that Batman is back with a vengeance, in the officially unofficial twelve-issue mini-series, The Odyssey. With Adams rumoured to be pulling the writing chores as well as pencilling, also shown here is a page where Neal lays down his own inks. Frank Miller will apparently script the tale, with other project inkers rumoured to include Jim Lee's frequent partner-in-crime Scott Williams, and fellow industry icon Kevin Nowlan. Either way this will be one Bat-project no one will want to miss. I waited until the DVD came out and the initial media coverage had played out. This movie made money only due to the unfortunate passing of Heath Ledger. Throughout the movie I transitioned from "when is this movie going to get good" to "when is this movie going to end." I guess that's a strength comics have over movies. Movies - you pay your money , walk in at the set time and get treated (or untreated) to the director and studios interpretation of the characters. With comics, you take it at your own time, with stories of varying length. With so many writers having written Batman, there's bound to be a trade paperback inline with your tastes aswell. (If not May's upcoming BATMAN: The Return Of Bruce Wayne probably will).